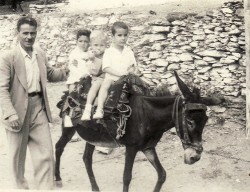 Above: With my father, Efstratios, and my cousin, Haralambos Petrellis (middle). 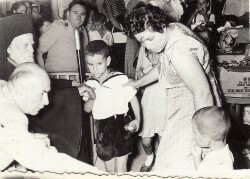 I am first from the right. Above Right: As a student at a school function, when the Bishop visited our school. 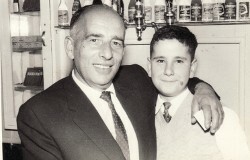 Above: With Stan Andis (Andonaras) at the Roslyn Cabaret. 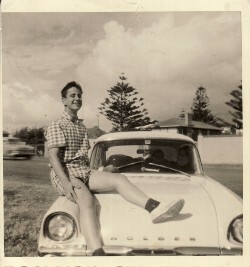 Above Right: As a teenager- at Wakanae. Above: Out. 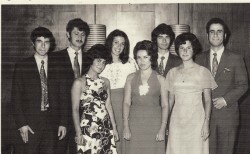 L-R: Giorgos Sotirhos, my brother, Ioannis, Nelli, Maria Hatzipavlou, Anna, Ioannis Sotirhos, Maria Sotirhos and myself. 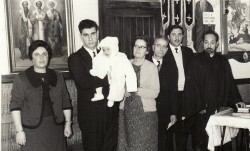 Above Right: Becoming godfather to Sarandos Ikonomou. L-R: Stella Ikonomou, myself-holding Sarandos, my parents, Irini and Efstratios, Dimitrios Ikonomou and Rev. Apostolellis. Above: Family and friends. 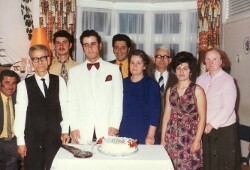 L-R: Spyro Zavogianni, my father, Efstratios, my brother, Ioannis, myself, Sarandos Tiropolis, my mother, Irini, my uncle, "Jack", Panagiota Tiropoli and my aunt, Flora.